We carry an extensive parts inventory for many of the lithography systems currently in use today. With cost control and availability a concern, we offer our customers globally located parts depots with advanced parts exchange programs. 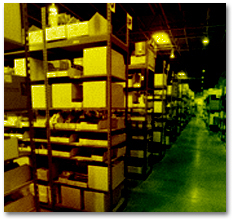 These well stocked parts depots are in major manufacturing centers worldwide. For remote facilities, bonded warehouse parts distribution is available. We are able to provide delivery of parts from just a few hours to within 24 hours of the purchase order issued, globally. We provide our customers convenient parts support without the in-house overhead.